We can now have a baby girl. And to end on another happy note, are these not the cutest things you have ever seen? Those ARE cute. And kudos on the quilt. I made a baby quilt during my Laurel days as well. It's purple, blue, and pink if I recall. I guess I was trying to cover all my bases. Plus, those are the cutest ever. I have a knitting pattern for a sock monkey hat by the way. Hope to make it someday in the relatively near future! Back to you and your wonderfulment, The quilt looks awesome. Have fun with it! And... good luck on whatever your next project is. I'm... on a school thing now that is keeping me from everything else. But it will be done by Monday, and then I'm on to scarves and gloves and... an endlessly scary list of possibilities! Hey, cool! I remember that quilt! :) Good job for finishing it, better late than never! 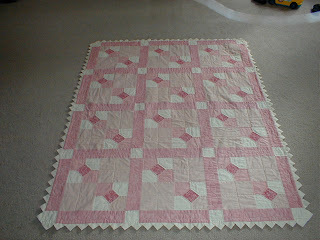 Funny thing is that when I started this quilt I was still passionately opposed to all things pink. I'm not quite sure how I ended up making a pink toned quilt.